For quite a while, my slow cooker was broken. I mean, the Crock-Pot itself worked just fine. But the lid was broken, making it tricky to get to the food when the pot was hot. Then I remembered my mom and dad’s Crock-Pot had the same issue a few years back. My dad DIYed a fix for it. So I copied his method. 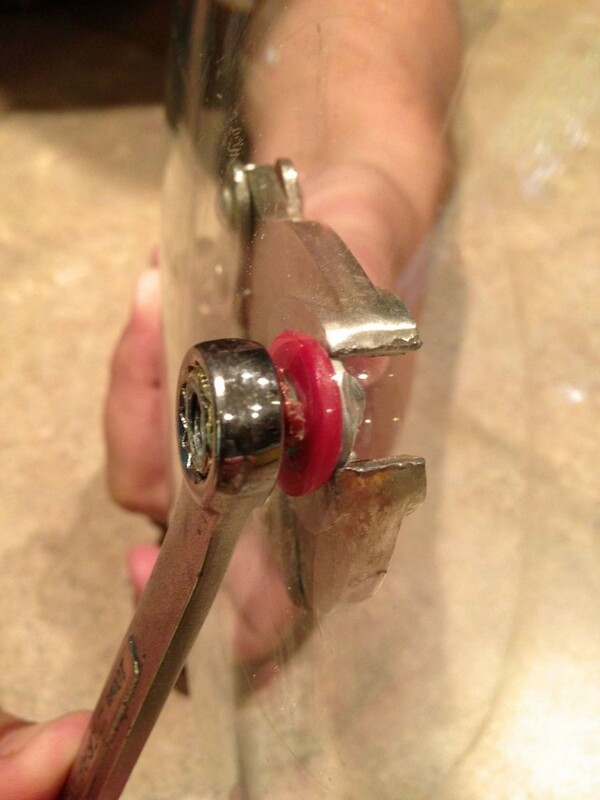 First, we used a set of grips and a socket wrench to get the hardware removed from the lid. This was the hardest part of the whole project. That’s it! My Crock-Pot is now as good as new (almost). 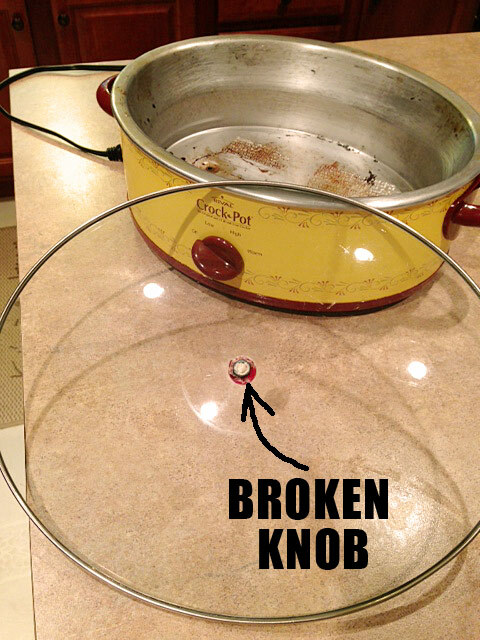 It took a total of about 20 minutes to figure out how to fix a broken Crock-Pot and complete the repair. My pot holds seven quarts, so I saved myself at least $50 in replacement costs. Score! 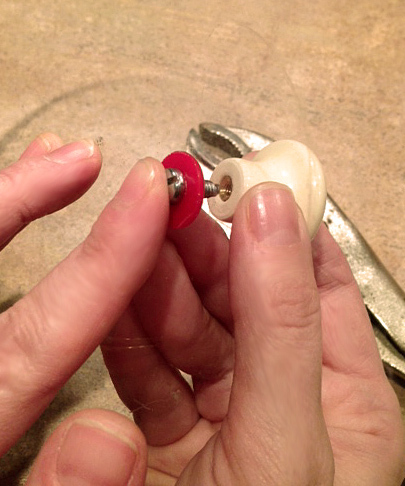 This entry was posted in Food, Frugal living, How to, Kitchen, Money-saving mends by Susan. Bookmark the permalink. I did something similar with my crock pot too! I had some wires that I doubled and trippled and made a loop and used a nut and bolt. The wire doesn’t get hot, surprisingly. A knob would work too, if I had one. Also, I visited a yard sale over the summer and literally found a lid that someone didn’t want and got it free! It fit, so now I have two lids! 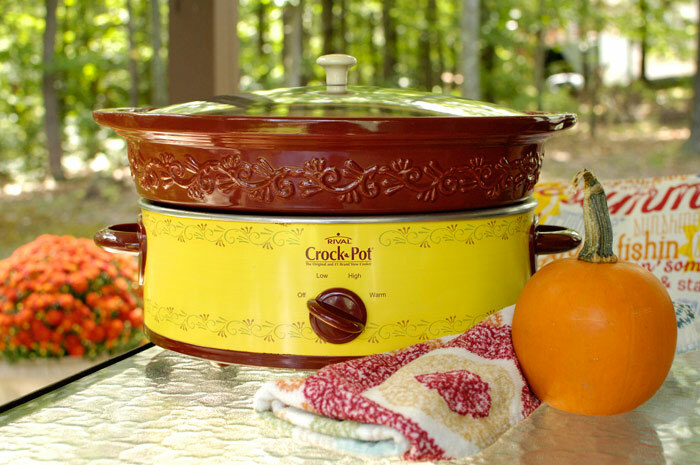 What do you do with your crock pot when it dies? Toss the outside part and save the bowl part and use for a flower pot, inside or outside! Love it! If The heating part breaks, you can use the crock for flowers. I recommend putting some stones in the bottom for drainage and potting soil on top before planting flowers. My handle just broke off this past week! This post could not have come at a better time!! So going to try this!! So glad this was helpful to you, Patricia! 🙂 Best of luck repairing yours. I brole my crock pot. I was washing the crockery and managed to bump it against the side of the sink and it broke in half. The pot was not hot at the time nor is it an older pot. It’s less than a year old and I love the thing. Any ideas on what sort of glue I could try to see if I can restore it to use as a crockpot again? Thank you for any suggestions!